Recognized as one of the early progenitors of the melodic death metal sound together with At the Gates, Dark Tranquillity and In Flames, Dissection was a band destined to reach soaring heights of success. Instead of cultivating its potential the band fell apart due to interpersonal trouble at the height of its popularity in 1997. Dissection played a dramatic and highly versatile mix of death -, and thrash – with New Wave Of British Heavy Metal type melodies and riff schematics. In its original run the band released two records, of which “The Somberlain” is the first, and by far most traditional heavy metal sounding. Dissection was formulated in 1989 in Strömstad, Sweden by Jon Nödtveidt (vocals, lead guitar) and Peter Palmdahl (bass guitar), both were members of the shortlived Siren’s Yell before breaking ranks to form their own project. Ole Öhman (drums) was brought in from late 80s thrash metal act Rabbit’s Carrot, where Nödtveidt also figured into prior to his involvement with Siren’s Yell. John Zwetsloot was a local guitarist with a classical background that had no prior experience before joining. In the next couple of years the freshly formed Dissection produced and distributed a number of demo tapes that led to recording contract with No Fashion Records. In the two-year timespan from 1991 to 1993 Dissection recorded and distributed four demos tapes. In 1991 “The Grief Prophecy” and “Into Infinite Obscurity” were both released. The “The Somberlain” pre-production demo followed in 1992, and finally, “Promo ‘93” was circulated in 1993. Of these two tracks of the 1991 “Into Infinite Obscurity” were refurbished (omitting ‘Son Of the Mourning’, which was part of the band’s live set), along with all tracks of the “The Somberlain” pre-production from 1992. The remainder of the album was written specifically for the session. During the “The Somberlain” pre-production and rehearsals sessions the band relocated to a studio space in Gothenburg, which they shared with local then-abstract death metal force At the Gates. While typically categorized as melodic black metal Dissection is anything but. “The Somberlain” is a heavy death metal record first and foremost. No other band (with exception of Luciferion), before or since, combined death -, thrash – and traditional metal in such an elegant manner that it emphasized the strength of each. Each of these songs are meticulously structured exercises full of sweeping traditional metal riffing, grandiose triumphant melodies alternated seamlessly with hardened death metal chord progressions and acoustic - and electric solo sections. One of Dissection's biggest strengths was its proclivity for melodramatic, epic song arrangements and its lineage towards earlier traditional metal styles. What makes it different from its more streamlined follow-up is classical guitarist John Zwetsloot. He was responsible for much of the album’s traditional metal aspect, and wrote all three acoustic guitar interludes that came to characterize “The Somberlain”. Compared to its second album “Storm Of the Light’s Bane” the material is more deliberately paced with a great emphasis on its NWOBHM and Iron Maiden stylings. Dan Swanö provided the falsetto scream and clean singing on ‘Black Horizons’, a song introduced by a sentence that would later appear in the lyrics to ‘Where Dead Angels Lie’ played backwards. The song was already written at this juncture, but would only appear on the band’s second album “Storm Of the Light’s Bane” a few years later. John Zwetsloot co-wrote ‘Black Horizons’, ‘Heaven’s Damnation’, ‘In the Cold Winds Of Nowhere’, and ‘Mistress Of the Bleeding Sorrow’ along with the three compact acoustic guitar interludes. Peter Palmdahl (bass guitar) co-wrote ‘A Land Forlorn’ and Ole Öhman (drums) co-wrote ‘The Grief Prophecy/Shadows Over A Lost Kingdom’. The black metal aspects of “The Somberlain”, mostly the serpentine vocals and the admittedly well-written lyrics, are inconsequential at best and tenuous at worst. 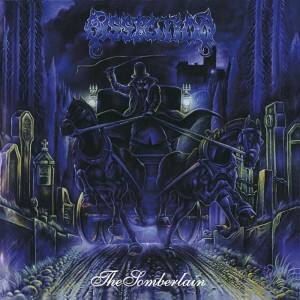 “The Somberlain” was recorded during one week at Hellspawn Studio (a later incarnation of Gorysound Studio before it changed its name to the popularly known Unisound Studio) with prolific producer Dan Swäno. All of the instruments are evenly balanced and given enough space to fully breathe, especially Palmdahl's throbbing bass guitar features prominently in the mix. The artwork was rendered by the much in-demand artist Kristian Wåhlin (Necrolord), a respected scene veteran famous for his work with legendary Swedish proto-death/black metal band Grotesque, which also featured a young Tompa Lindberg (later of At the Gates) in its lineup. On the hood of the carriage the band’s flaming trident cross sigil can be seen, this trident would feature much more visibly on the second Dissection album. Released in 1993 through Scandinavian death/black metal specialist label No Fashion Records, who famously housed the early catalog of Swedish genre pillars Dark Funeral and Marduk, “The Somberlain” was dedicated to the memory of the late Øystein Aarseth (Euronymous) of formative Norwegian black metal band Mayhem. The dedication isn’t without reason as Nödtveidt briefly operated the Swedish branch of the Helvete record store in the Gothenburg area with Tony Särkkä (IT from Ophthalamia, and Abruptum). The original Helvete store in Oslo only was around for two years (from 1991 to 1993), its Swedish branch existed for an even shorter period of time. Dissection, realizing the potency of its creation, dubbed its genre “metal of death” to differentiate itself from the death metal bands of its region, and to loosely affiliate itself ideologically with the burdgeoning Scandinavian black metal scene. The album made so much of an impact that fellow Swedes Naglfar lifted the sound of “The Somberlain” in its entirety, while ramping up the Iron Maiden influence, for its own major label debut “Vittra”. This inspired bands in Europe (and beyond) to start mimicking Dissection thus starting a movement. While the wave has crested the influence of the first Dissection record is still felt today. German band Thulcandra has made its unabashed and unapologetic Dissection worship its entire raison d'être. As far as melodic Swedish death metal goes “The Somberlain” is the cream of the crop together with the works of Luciferion.